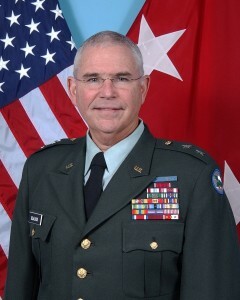 Major General A. C. Blalock serves as Adjutant General of the Alabama National Guard. In this capacity, he is responsible for providing support to all state units in training, administration, logistics, supply, maintenance and other applicable programs or functions. His most recent assignment was Commander of the 167thTheater Sustainment Command. The command is a Theater level headquarters with more than 350 personnel assigned that provides operational logistical command and control for NORTHCOM. General Blalock was commissioned in March 1971 after completing ROTC at Virginia Military Institute and Auburn University. His early assignments were in the 31st Armored Brigade (Sep). He has served as Commander of an Infantry Company, a Heavy Support Battalion, an Area Support Group and a Chemical Brigade.